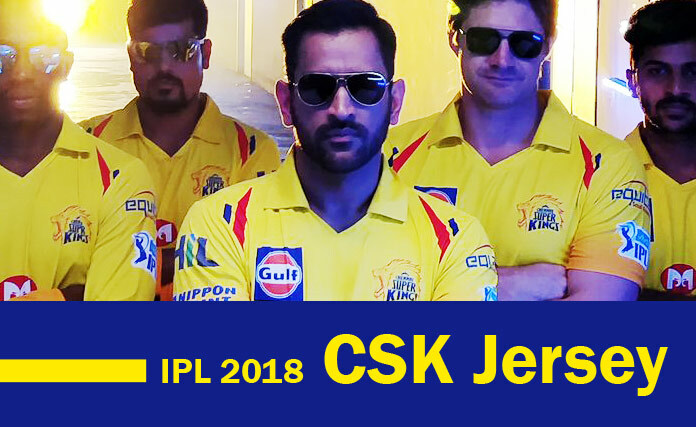 IPL 2018 CSK Jersey: Chennai Super Kings are back again with a new yellow jersey with new kit manufacturers. Seven is official CSK shirt manufacturer for IPL 11th edition. Muthoot Group in the front as new, India Cements in back, and Gulf Oil in the chest. After a two-year suspension hiatus, CSK are coming back to play IPL T20 tournament. The team launched their new jersey on 9th March which is now available in market officially and unofficially. CSK’s new jersey have collected mixed reactions from the audience. Most of them saying that this new one looks dull, they all need old one again. Some others missing the major mark of Aircell logo in front. Also, most of other liked this new jersey of Chennai Super Kings. If you are the one in that, then this article is for you. Also, it is a place if you are the one who likes CSK’s old jersey. Both CSK T-shirts and Jerseys are available on online and offline stores. When wearing Chennai Super Kings Jersey, it gives some other power to the players when they play at home venue. If you don’t know how To buy Chennai Super Kings Jersey Online, then read the following. There is an official online shop for CSK, click here to see which is currently unavailable where you can purchase official CSK T-shirts, CSK caps, CSK bags, and CSK mobile covers. So, please visit other major online stores like Amazon or Flipkart to purchase No. 7 MS Dhoni T-shirt in yellow. Buy Replica CSK t-shirt or jersey at cheap price at Amazon. Also get back Rs 50 on your Amazon Pay Balance. Note: Latest official CSK jersey is not available at the moment! We will update here if it is available online or any outlets. Also, check new RCB Jersey here for IPL 2018 and Book Indian Premier League (IPL) Ticket online. Check IPL 2018 Complete Schedule and download IPL 11 Timetable PDF if you want it!